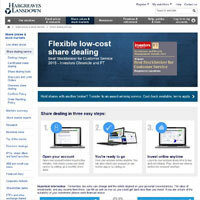 Hargreaves Lansdown are a UK shares specialist. They offer a wide variety of shares-specific tools and services, with per-trade pricing and no charges for inactivity. You can also opt to receive regular updates from their shares specialists, providing insight into current and potential future markets. When trading online, it is important to remember that you can lose your capital. HL.co.uk is a shares-specific trading website which offers access to ISAs, pensions, bonds and gilts. If you’re hoping to trade in a wide variety of markets other than shares, HargreavesLansdown probably isn’t the best website for you, but it claims to be the number one choice for UK shares trades, with award winning customer service. A shares-specific trading website which offers access to ISAs, pensions, bonds and gilts. The site offers access to an array of expert advice through a newsletter or alerts system, with web pages which provide information on a range of investment opportunities. Some of these are specific to pensions or children, with options to open an independent savings account which can shelter up to £15,240 from tax. You can also transfer or link existing accounts to take control of them all from one access point. Share accounts take just a few minutes to open and allow you to hold shares for free. You can start with just £1 or £25 monthly, taking advantage of several free share trading tools. We’ll get to those shortly, but it’s worth highlighting the fees per trade, as these may influence your decision to trade on Hargreaves Lansdown. This site is better suited to infrequent traders who wish to make longer-term investments, as its pay-per-trade fees are relatively high. That said, the more often you trade, the cheaper it becomes. Investment opportunities tend to revolve around savings accounts (pensions or college funds, for example) and utilising expertise from the team’s set of portfolios. You can check up-to-date share prices instantly, at no cost. When combined with the various free charting tools, this can help you to build predictions of potential market changes. Market overviews (for the UK, world, currencies and commodities) are clearly displayed alongside the most viewed shares, so you can get a general understanding of current interest. Quick access to market overviews, including most-viewed shares. If you’re not really sure what to invest in, the site offers a decent amount of information and suggestions.You can set your loss limits, meaning you will auto-sell before your stocks fall too low, reducing your risk somewhat. The site is simple to use, with ready-made portfolios, decision-making assistance, general trading advice and more, making it useful for newcomers to online trading. Several share-dealing tools are available to users, providing a comprehensive range of features to improve your investment opportunities. Weekly emails contain expert share-trading advice, with live share prices and single-point control over multiple accounts. You can take advantage of instant alerts to make sure you don’t miss a deal, set your loss limits or keep a watch list of potential investments. Your display is also customisable, so you can display your holdings in a way which suits your trading preferences. If you’re on the move a lot, you can download free apps for smart phones and tablets. HL.co.uk may seem limited for some investors, but if you’re interested in setting up savings accounts and tying multiple share accounts into one, it has plenty of useful options. It’s also worth signing up for the site’s expert advice, with free access to daily market updates. Since trading fees can be a little higher than usual, this site is probably best suited to traders who are looking for longer-term investments rather than regular buying and selling options. If you are interested in long-term investments, we suggest you have a look at what Hargreaves Lansdown can offer you.